Students are uncertain how to narrow down to a specific, manageable research question. Students are often unsure how to begin their research. Students are unaware of the major sources of information in their discipline or subject area - or how best to search these sources. Students describe the expectation of evaluating information sources as a major shift from their high school experience. Students rely heavily on abstracts and on text searching to extract information from complex sources. Students find quoting, paraphrasing, and citing, overwhelming, and can sometimes fixate on the mechanics of writing. Information literacy is a set of abilities requiring individuals to "recognize when information is needed and have the ability to locate, evaluate, and use effectively the needed information." Information literacy also is increasingly important in the contemporary environment of rapid technological change and proliferating information resources. Because of the escalating complexity of this environment, individuals are faced with diverse, abundant information choices--in their academic studies, in the workplace, and in their personal lives. 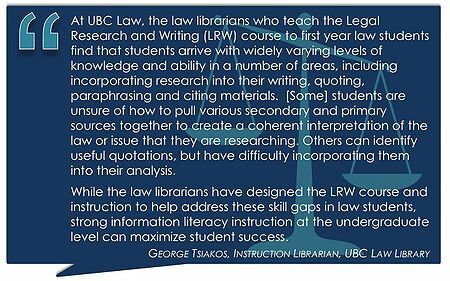 In 2013, the Teaching and Learning Advisory Committee of UBC Library developed an assessment project to provide insight into student needs and expectations of research support. Focus groups with first year students unearthed interesting perspectives on research that could influence both how assignments are developed and how research instruction is provided. 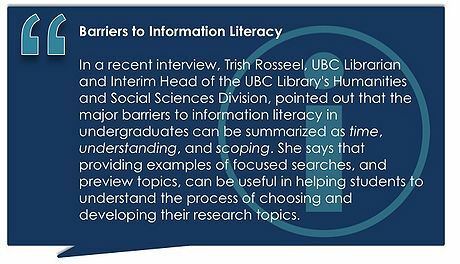 The Information Literacy Toolkit for Faculty and Instructors, created in partnership with UBC librarians, faculty members, and students, was developed to support the creation of research assignments and instruction that address students' information literacy levels and needs. In the spring of 2013, learning and assessment librarians from the UBC Library met with groups of first year students to ask them about their experience and understanding of research as their first term of studies drew to a close. The conversations between the students and librarians revealed quite a lot about how students approach research at the beginning of their academic careers. There are five fundamental elements to the research skills students need to learn in order to succeed in first year and beyond. This video introduces the element of "scoping" the information need. Scoping is the activity students engage in when they select or narrow their topic by asking questions, by taking a stance on the issue at hand, and/or by identifying and selecting stances to explore. This may occur simultaneously with the Finding and Evaluating elements, as students explore the available information and refine their research question(s). Creating research assignments that connect to course content is at the root of developing clear assignments. However, anchoring the assignments to key terms, ideas, and elements of the subject discourse that have been covered in the class so far will provide students with a starting point for selecting a topic that is both reflective of the course work and provides a basis to begin searching for additional resources. Examples of these kinds of starting points include topic keywords/terms; major ideas covered in class; authors covered in class. The concern that scoping too early and too narrowly can limit the student's creativity and learning experience is a valid one. However, examinations of the first year research experience, including those performed here at UBC, also reveal that assigning broad topics can leave students feeling lost, frustrated, and discourage them from investing time and effort in the project at hand. How can you use the catalog to find an appropriate section of the library for browsing? How do you choose which texts to look at? How do you evaluate a book through its table of contents and index? How do you skim chapters? What are the general organizational structures of scholarly articles in the field? Where might they find a section on the review of the literature? What indicators do scholars use to highlight their own position? Where might scholars consider counterarguments, and how are those indicated? How might students identify the scholarship associated with a particular line of arguments in a text? How to enter key terms into a range of disciplinary databases to see what kinds of articles show up and how-to decode the results so as to see the different disciplinary arguments about an issue? Critically analyzing the ways that databases and disciplines use key terms." - Nutefall, J. E., & Ryder, P. M. (2010). The Serendipitous Research Process. The Journal of Academic Librarianship, 36(3), 228–234. Supporting the development of scoping skills can also mean encouraging students to select a manageable topic early on in the process. This provides them with more time and focus and creates a higher chance that they will invest in the assignment. Provide examples of how to scope a broad topic into a question that is researchable. Emphasize the importance of taking a stance, asking a question, or exploring two sides of an issue. Provide students with examples of internet, library and database searches used to find appropriate articles. There are five fundamental elements to the research skills students need to learn in order to succeed in first year and beyond. This video introduces the element of finding information. Finding here refers to locating resources. This will involve using both library and other sources, both physical and web-based. Keyword searching, browsing, and citation chaining may be among the strategies used in this element. Help students understand that useful sources may look vastly different depending on the discipline/topic. Make your definitions clear: what constitutes a “scholarly” or “empirical” source in your discipline? What does your field define as a “primary” source? Provide students with examples of articles that are appropriate in scholarship, tone, scope, topic coverage. Starting with general reference sources, including credible websites, helps students gain knowledge about complex ideas and jargon heavy subject areas. Providing support for exploring these resources may help reduce the frustration students have with more dense peer review/scholarly journal articles and books and will assist more invested reading of this material. Students are often unaware of disciplinary vocabulary and organization. Reference sources, glossaries, and specialized dictionaries are available for many subject areas through the UBC Library catalogue, Summon, and the Research Guides for each discipline and subject. ProQuest Databases, such Canadian Newsstand. Limiting the use of freely available sources, such as Wikipedia, is almost an impossible task. Consider instructing students on how and when they can use freely available sources. Wikipedia on Wikipedia: Wikipedia's entry on using Wikipedia in scholarly research. Using Wikipedia for Academic Research: a video overview of when (and when NOT) to use Wikipedia for research. Students don't always fully understand the kinds of sources and content that they can and can’t expect to find in the academic literature. The information lifecycle is the time it takes for an research to go from idea to publication. For academic scholarship, this can sometimes take several years. Sometimes students don't recognize the time the information lifecycle takes; they don’t understand that while scholarly material on a very timely topic might not exist, there will be other places in the discourse where they can build connections that they can use to synthesize an argument about a current event. 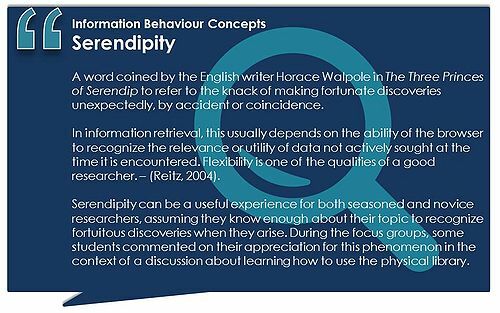 Similarly, this skill is important in data-based research (using related data, making inferences/applications). Assisting students in considering whether the information content and format required for their research is readily available through the library or the open web can reduce a lot of confusion. One way to prepare is to work with your subject librarian during the assignment development phase to assist in focusing student expectation of available resources. There are five fundamental elements to the research skills students need to learn in order to succeed in first year and beyond. This video introduces the element of evaluating information. Evaluating information is when students determine the usefulness of individual resources - their relevance to the topic being researched; whether they are scholarly or popular; and where they are situated within the discourse on the topic at hand. Many students do not yet have the skills and/or knowledge to differentiate scholarly sources from popular ones, or even primary sources from secondary ones. Instruction and assignment descriptions which clearly indicate the types of resources you expect students to use, and how you/your discipline define those types, can help students to think critically about information sources. Consider providing class time for students to examine examples and practice differentiating and critiquing the different types of sources they are expected to use (primary/secondary; scholarly/popular/empirical; etc). Emphasizing that just because an article fits the basic criteria for scholarship doesn’t make it equal to all other scholarly works is an important way to begin the discussion about scholarship itself. One way to do this is to emphasize that a students' final paper (or other finished product) should make clear the value of each source used. Assignments that ask students to question, "Why this one and not the other articles they came across?" will yield more thought-provoking work. Requiring students to use specific databases can help them focus their research - but it can also take ownership away from students, and make them hesitant to deviate from your instructions if they find useful resources outside of the required sources. Consider placing more emphasis on “teaching them to fish” - explaining what characteristics of your recommended/required sources make them useful, and encouraging students to apply those criteria to other sources as well. There are five fundamental elements to the research skills students need to learn in order to succeed in first year and beyond. This video introduces the element of reading information. Reading here refers to the comprehension of individual resources. It is important for students to develop the skills to avoid reading word-for-word, to move beyond the abstract, and to use techniques such as scanning, highlighting, notetaking. Provide examples and practice with scanning and extracting pertinent information from scholarly articles. Provide students with examples of how to read, mark up, and extract information from these articles - show them how YOU do it, and they can model their own work on your example. Instruct students to have questions in mind as they read, firmly rooted in their narrowed topic, so that they can recognize potential answers as they read. 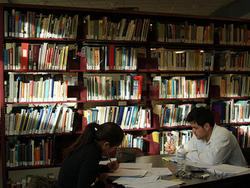 Requiring research notes, an annotated bibliography or research portfolio, or a rough draft can encourage students to begin the research process earlier, and to consider all stages of it equally important, encouraging students to engage in the reading process in a meaningful way, rather than racing to their final product. While this can be time intensive, alternate forms of grading and review, such as peer review or presentation, can minimize the administrative time while providing students important and timely feedback. There are five fundamental elements to the research skills students need to learn in order to succeed in first year and beyond. This video introduces the element of using information. Using here refers to students using pertinent information in their work in the form of quotes, paraphrases, and other formats; using appropriate citation; using extracted information in support of topic/stance(s); synthesizing new ideas from analysis of the ideas in the information sources they have read; and showing that they can situate their own work within the discourse of the topic/discipline. Am I measuring students’ ability to be detail-oriented? Am I measuring the findability of their resources? Am I measuring student readiness to enter into the academic discourse by their use and respect of the work of other researchers? Students spend a larger proportion of their time on citing than is reflected in the percentage of their grade it makes up - sometimes because they feel this is the only binary “right or wrong” aspect of their grade that they can control. Carefully considering and emphasizing the purpose behind citation requirements can help students understand these requirements, and encourage them to budget their time more effectively on other parts of their research. While citations can be complicated, students' lack of understanding around the very elements of a citation (e.g journal title, year, number, etc.) is often at the root of their frustration when formatting their papers. Provide instruction on the elements of citations. Encourage peer proofreading of citations. Provide access to online resources to assist students in learning about how to cite. 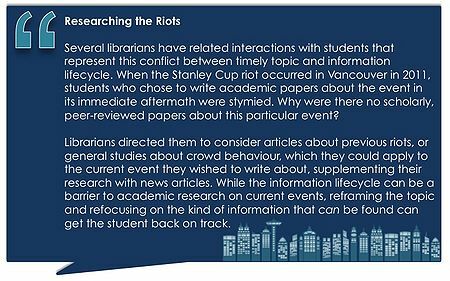 The following are examples of real assignments from real UBC instructors and faculty which effectively communicate to students the importance of one or more of the 5 major information literacy skill areas. While these assignments are drawn from various disciplines and different levels of study, each of them exemplifies the kind of careful scaffolding that can assist students in practicing and developing these skills. Each assignment has been annotated with commentary indicating the strong information literacy components it contains. The Association of College and Research Libraries (ACRL) has developed a set of Information Literacy Competency Standards to describe in detail what information literate individuals should be able to do in their interactions with information – specifically, in the college environment, their interaction with the research process. From the large and, at times, broadly stated guidelines provided by the ACRL, we have attempted to create a series of questions, organized into checklists grounded in five major information literacy areas. In the footnotes for each checklist you will find the ACRL Competencies on which the questions were built. The purpose of these checklists is to assist in maximizing assignment potential and to enhance and build student information literacy skills. For a printable checklist with references, download as a PDF. Communicate to students that they must narrow and/or modify the topic, likely through formulating specific questions, to achieve a manageable focus? Build on key concepts, terms and resources that have been explored in class, and/or direct students to them? Encourage and equip students to create an appropriate research plan (eg, a timeline for the steps involved in completing the assignment)? Provide guidance to students as to how and where to begin the research process, and indicate potential reference sources? Include links and/or referrals to appropriate resources, such as library resources and librarians? Equip students to recognize, comprehend and utilize search strategies and data-gathering techniques appropriate/necessary to the discipline/subject being studied? Encourage students to see the research process as a learning experience, through which to acquire new skills that will serve them after the course is over? Encourage students to learn (in class and/or at the library) and use a variety of search strategies (keyword searching, browsing, citation chaining, etc), gathering important search terms as they encounter them? Make explicitly clear the types of resources students are expected to use, and indicate or refer to likely starting points for research in the scholarly and popular literature of the discipline being studied (particular databases, search engines, journals, reference sources, sections of the library)? Encourage students to consult a variety of sources and to compare their usefulness and relevance before settling on the best sources to use? Explain, or encourage students to explore, differing viewpoints on the topic? Provide the student with the knowledge and practice necessary to efficiently assess the quality of information sources found during the research process? Prepare the student to identify, differentiate, and assess the usefulness of different types of resources (visual/textual; primary/secondary; popular/scholarly; current/historical; etc)? Ensure that students are aware of effective reading strategies appropriate to the materials and/or discipline being studied, encouraging the use of techniques for such as notetaking, highlighting, and scanning? Clarify for students that they will need to engage, respond to, and integrate information gathered through research in order to generate their own arguments and conclusions? Ensure that students are aware that reading for academic research requires examination and comparison of methods, data, and conclusions in the resources they read? Provide students with guidance and resources to assist them in collecting, organizing, and storing their research appropriately and reliably? Assist students in learning how to create a synthesis of their own ideas and the ideas they uncover through research? Equip students to create an organized, polished final product focussed on a central purpose or thesis, in an appropriate, engaging format? Communicate to students that their final product should demonstrate their growth and development as scholars, and their understanding of the process of research and writing? Support students in the design and execution of their final product, providing samples, guidelines, and resources as necessary? Clarify the expected citation style(s), and direct students to useful, comprehensible resources to assist them in citation, appropriate use of copyrighted materials, and avoidance of plagiarism? Faculty interested in providing students with guidance on finding, accessing and incorporating research into their course assignments can find support from their | Subject Librarian. Subject Librarians collaborate on developing assignments, workshops, and web guides that meet the needs of the course and build information skills needed for students to become successful not only in the coursework, but in their daily lives. The following provides resources for each of the five fundamental research skills elements. Getting Started on Your Research assists students in understanding assignments and developing a research plan. 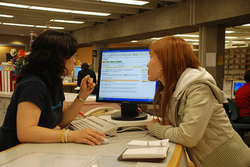 UBC Library AskAway, provides instant messaging research help services to students, faculty, and staff. General help on finding various types of resources, including data, images and video, maps, and much more. Primary sources across different disciplines. Research Guides for every discipline studied at UBC. Includes major sources, search tips and strategies, and librarian contact information. Directing students to the appropriate research guide(s) on the Library website, or adapting their content for your own use is an excellent way to support student research success. All UBC Library guides are available for use in your course. The UBC Library's subscription to Ulrichsweb, an online database which profiles thousands of academic journals, indicating if they are peer-reviewed, as well as providing a detailed description of each publication. See also the sample assignments below in the Information Literacy Assignments section of this Toolkit, particularly UBC examples 2 and 3, which involve require students to document their research process. The APA, MLA and Chicago style guides, on the importance of citation. “Why We Cite” from the University of North Carolina. Writing Centre: The Learning Commons provides one-to-one writing help by appointment or drop-in. UBC Library How to Cite Guidecovers the major citation styles, and provides links to citation management tools. Purdue OWL Guide: Provides up-to-date overviews and examples from the major citation styles. Basic Citation Styles quiz: Want students to practice the basics? Send them to this quick quiz, which provides real time corrections and explanations. Project Information Literacy's "practical PIL" page - examples of Information Literacy standards being applied by instructors and librarians. UBC LEAP (Chapman Learning Commons) YouTube Channel: Introduction to the Learning Commons, related resources, and research topics. Wagner College presentation on information literacy, identifying problem areas. "The Ithaka S+R US Faculty Survey has focused since its inception on capturing an accurate picture of faculty members' practices, attitudes, and needs. In the fifth triennial cycle, fielded in fall 2012, the survey focused on research and teaching practices broadly, as well as the dissemination, collecting, discovery, and access of research and teaching materials. Findings from this cycle of the Ithaka S+R US Faculty Survey will provide colleges and universities, libraries, learned societies, and academic publishers with insight into the evolving attitudes and practices of faculty members in the context of substantial environmental change for higher education." - Introduction to the Ithaka S+R US Faculty Survey. “Humanities Faculty Love the Library, Scientists Less Enthusiastic" from Library Journal. “Study Shows Gap Between Research Use, Classroom Adoption of Technology” from Inside Higher Ed. 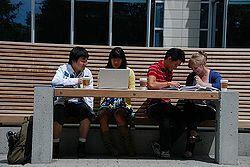 “Scholars Increasingly Use Online Resources, but Value Traditional Formats Too” from Chronicle. Whitmire, E. 2001. 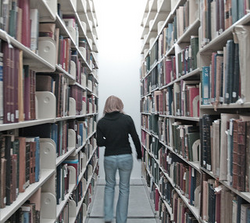 A longitudinal study of undergraduates’ academic library experiences. Journal of Academic Librarianship 27(5): 379–385. Massis, B. E. 2011. “Serendipitous” browsing versus library space. New Library World 112 (3/4): 178–182. Ellis, D. 1989. A behavioural approach to information retrieval system design. The Journal of Documentation 45(3): 171–212. Nutefall, J. E., & Ryder, P. M. (2010). The Serendipitous Research Process. The Journal of Academic Librarianship, 36(3), 228–234. 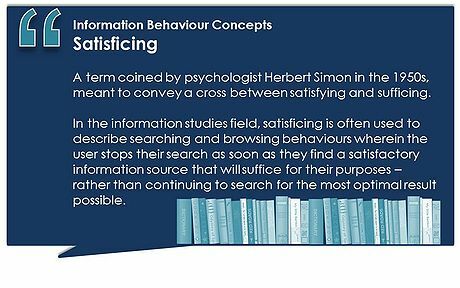 Schatz, J., Stennes-Spidahl, N., Mills, S. & Loehrelein, A. Bibliographic Induction: How KO Systems Optimize Browsing by Supporting Library Users' Prior Knowledge. Proceedings of the North American Society for Knowledge Organization, 2013. Lau, J., International Federation of Library Associations and Institutions, & ebrary, I. (2008). Information literacy: International perspectives. München: K.G. Saur. Mackey, T. P., & Jacobson, T. (2010). Collaborative information literacy assessments: Strategies for evaluating teaching and learning. New York: Neal-Schuman. This page was last edited on 9 August 2018, at 20:01.